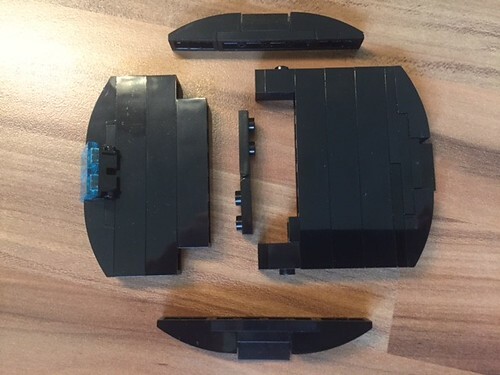 The first MOC I want to present on Eurobricks was an entry for the MOC Olympics contest on www.imperiumdersteine.de (German LUG). The task for the second Round was to build a ship or an iconic scene of the Empire or the First Order. A base of 32 x 32 was the limit. As you can see I decided to build an iconic scene of the Empire. 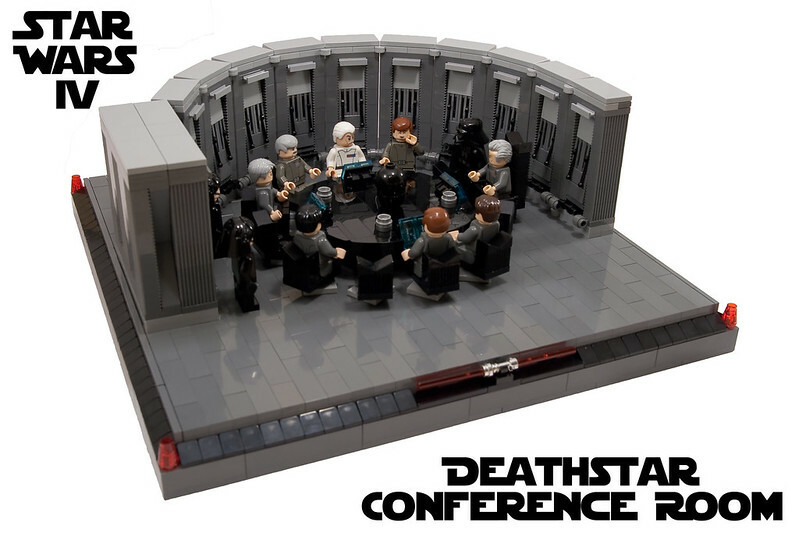 My MOC shows the meeting, which all the high members of the Imperial Military attended and where they debated whether to use the death star immediately or not. 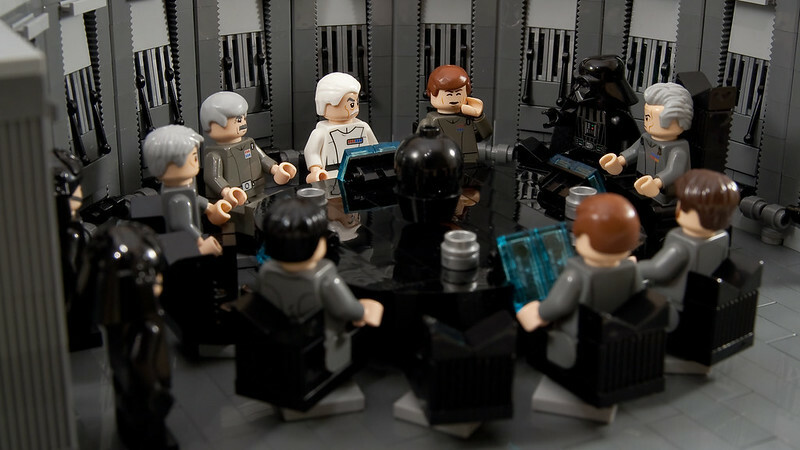 The meeting also resulted in Darth Vader briefly strangling Motti with the Force after the latter insubordinately retorted Vader's warning that the abilities of the Death Star were miniscule compared to the Force. I particularly like your version of the table -- those bricks are gleaming. Do you have any pics showing more clearly how it's made? Same here, love the table and chairs. I also love the walls. Great job and well done! I have seen this one on a couple of sites before and they did right to feature it: It looks very cool and captures a very memorable scene and the cold, factual mood of the set perfectly! Wonderful moc. Very clean. 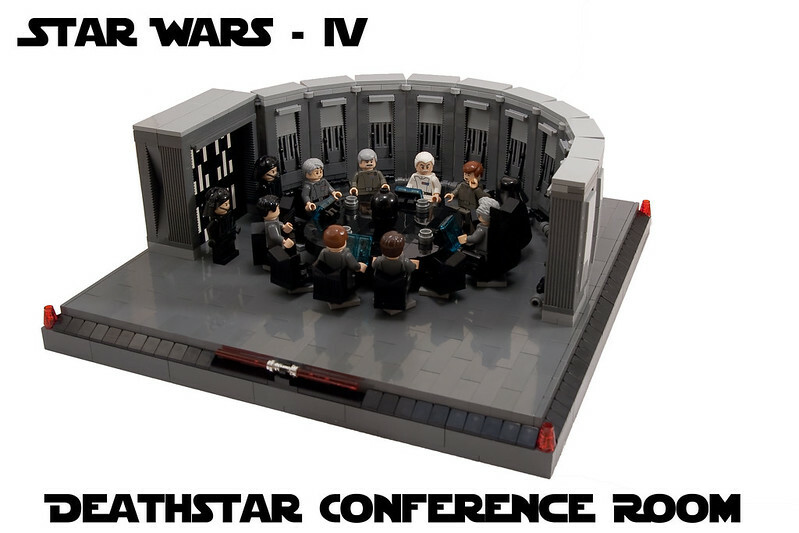 I have to agree with Raskolnikov and ISDAvenger that the table is awesome, but my favorite part is definitely the iconic death star hallway "wallpaper," (the white stripes on black). Thank your all for your nice comments. Of course, here are two pictures of the table and how it is build. It is not a perfect circle, but it works for me. Yes, it was blogged by the brothers-brick.com for example. Happy about that. 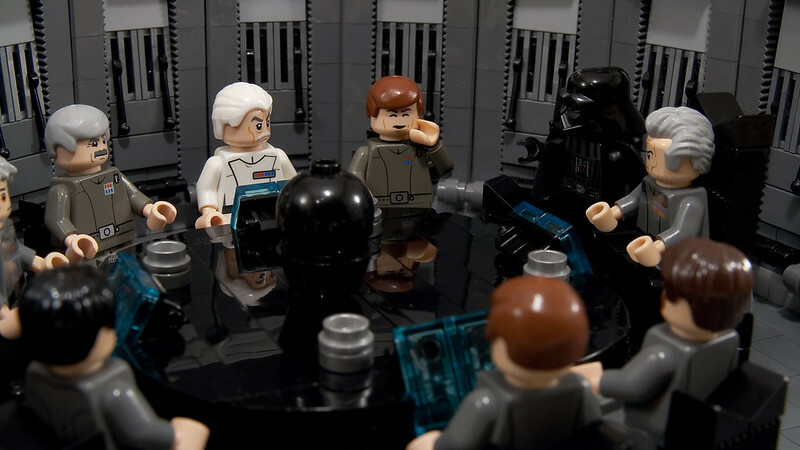 I love the expressions on all the mini fig faces, perfectly captures the moment from the film. 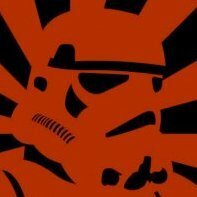 I particularly like the two moody looking death star troopers. Great display piece. That's so cool! One of my favourite scenes of episode IV, and very well recreated. Gorgeous work! Everything in it looks fantastic. I especially like the way you did the imperial lights! It's one of those scenes that will probably never get any kind of official release (I'm not counting the room on the DS) due to the fact it's just a meeting that has a heated argument but it's just such an iconic moment. The room looks great on this MOC... I really like how people handle the detailing of those imperial rooms that would be quite boring but the detailing and coving is excellent. I'll never tire of people recreating the lighting effects in plates with the white and black sections. That's awesome. Interesting use of lever pieces on the walls. I always find it intriguing how people recreate the wall panelling of Star Wars ships/stations. Yes, you are right. For me it is one of the most iconic moments for the empire. And that was the task for the comtetition, build an iconic scene of the empire. The problem was, that the original walls in the film are extremely boring and I had not much space (4 studs for each element) because 32x32 was the maximum base in this contest. 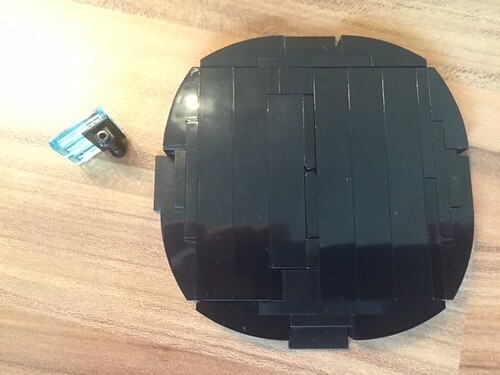 So I had to build a wall element that looks nearly similar to the film but isn't too boring in lego. The lever pieces and the 1x2 Bricks (Modified 1 x 2 with Grill) were good choices to add some texture. If you like I can make a photo of how the wall elements are build. 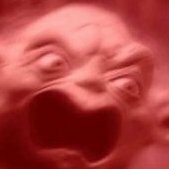 i cant see these images. 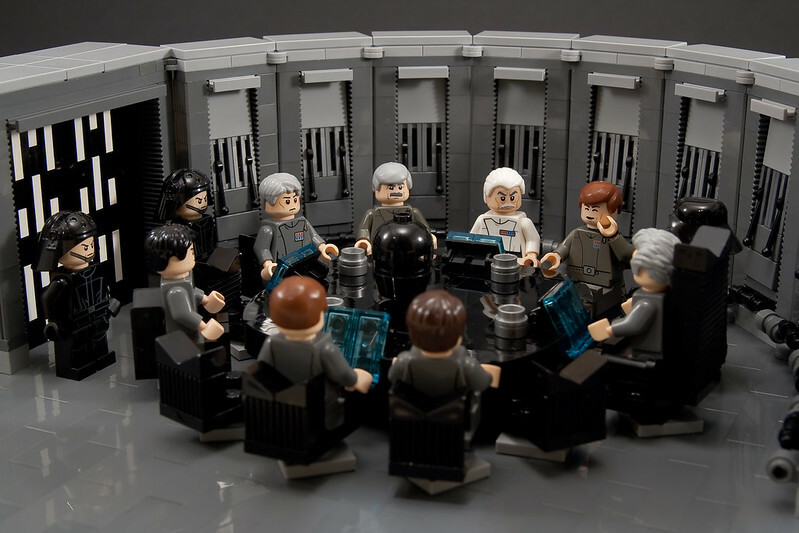 would love to see how this table was made so i can incorporate something similar with a holo on it for my imperial base.